So it begins! Roma wa ichinichi nishite narazu. This is our first blog so please expect this spot to evolve and grow as we go along. We are expecting it. So, who is/are The Magic Tea Kettle and what are they about? This blog will be a source for getting to know the proprietors of Magic Tea Kettle on Etsy. We will explore and share our travels between the United States and Japan, hopefully explaining and enriching the cultural appreciation and experiences that our store and art work brings to you. A bit about ourselves; Motoko and I, being Tyrus, both have backgrounds as artists and in fact met in art school at the University of Georgia. To keep the story short we are now married, living in Philadelphia and traveling back and forth to Japan to visit with family and work on art in different environments. Motoko holds an MFA in Fabric Design from the University of Georgia while Tyrus holds a degree in Painting. 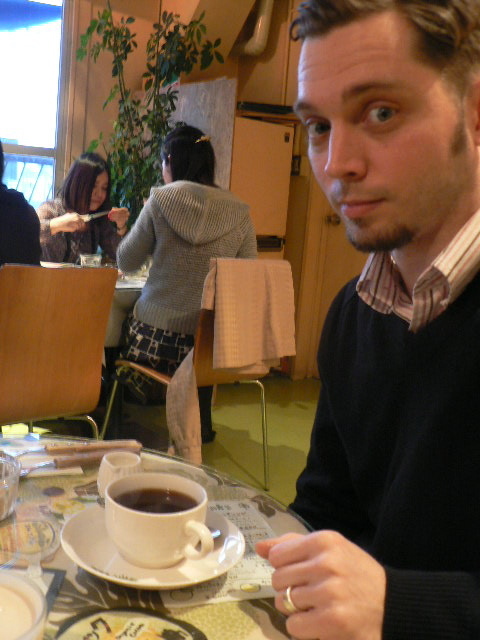 We recently just returned to the U.S. after 5 weeks in Japan. 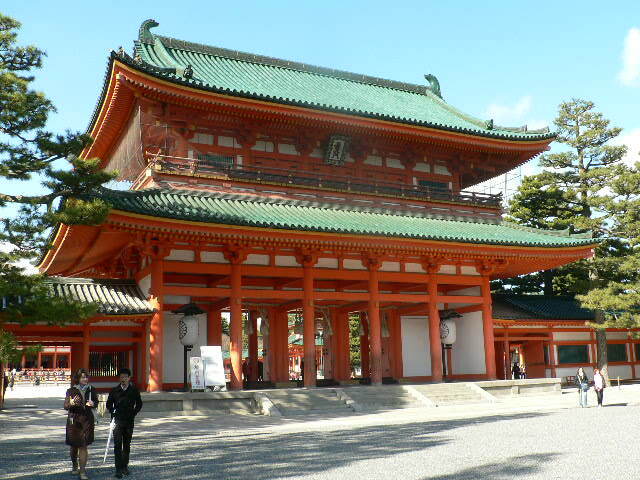 Motoko’s Parents live in Otsu which is located on the southern banks of Lake Biwa, right next to Kyoto. I’ve been going through about 3,000 photos and have been trying to whittle them down to share. 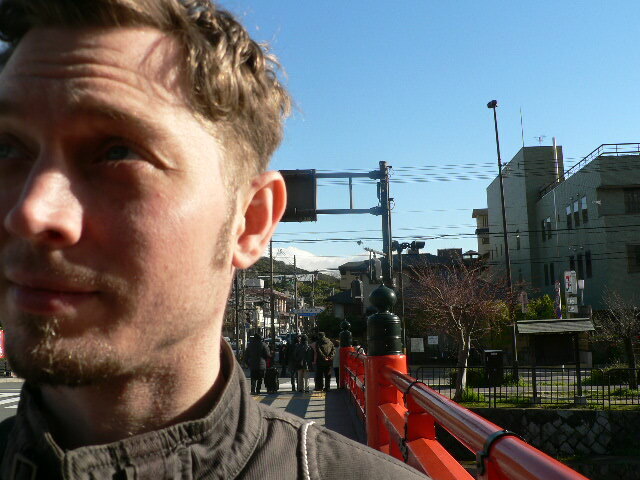 One of the first days we were there we took a day trip to Kyoto city, met up with Reiko, a good friend of Motoko’s, and took a little Yuzen printing class. 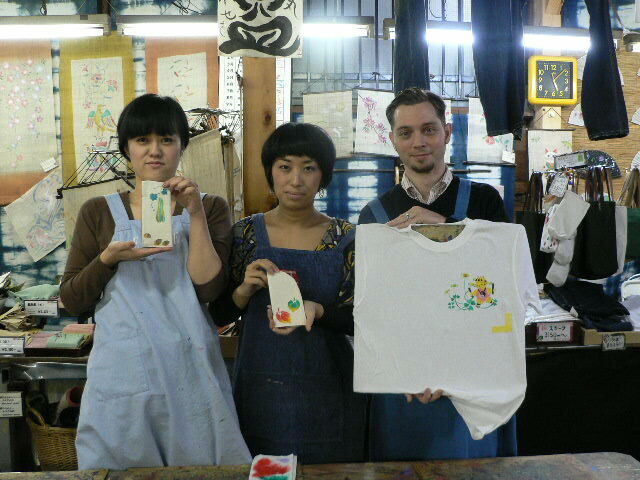 Yuzen is a printing method using one or more stencils. 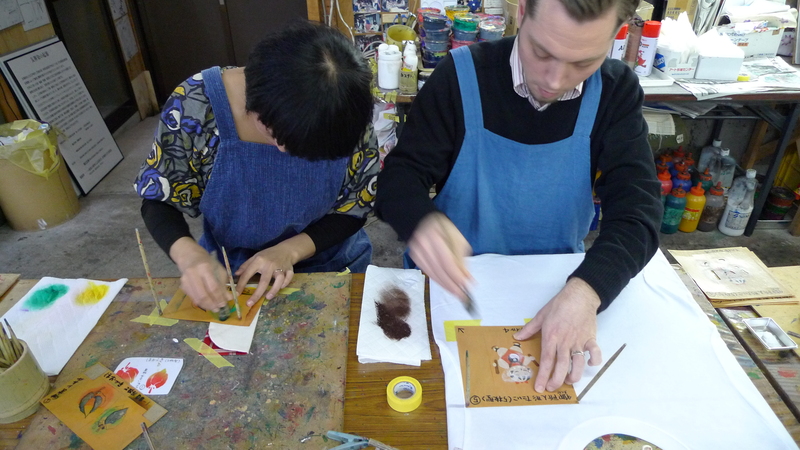 As I found out from the very nice instructor, “You must use a circular method when applying the dye and not by stamping the brush!” Except in Japanese. Did I mention I have a very tenuous grasp of the Japanese Language? Its getting better little by little but at that point I still had to deduce meanings by vocal tone and body language as well as a glance over at Motoko to see if I needed further correction. I’m not much past that point now. But I digress. Oh come on, everybody wants to write that at some point. I digress again. Yuzen made me think of a very early screen printing method, and I wouldn’t be surprised to learn the later grew out of the former. The method allows for some very singular and stylistic textile printing, with the graduation in tones achieved by the amount of pigment on your brush and the pressure of application. Some patterns we saw were a single stencil and others were 9-10 stencils, each of which needed to be registered. We used the fancy method of masking tape “L’s” on the corners of the design. Reiko is on the left, Motoko in the center, and I close it out on the right. 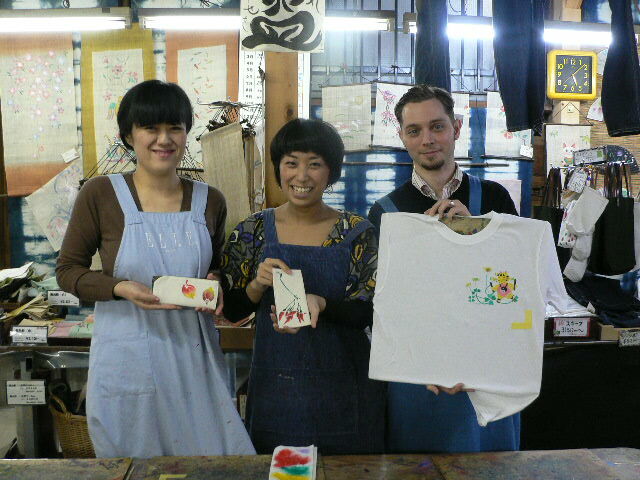 Motoko and Reiko both stenciled carriers for sunglasses and I made a t-shirt with a taiko drummer in a clover field; registration tape still on the shirt in photo. After the Cafe we wandered around the city got some dinner and drinks and on the way home tripped over a shrine dedicated to Tanuki. 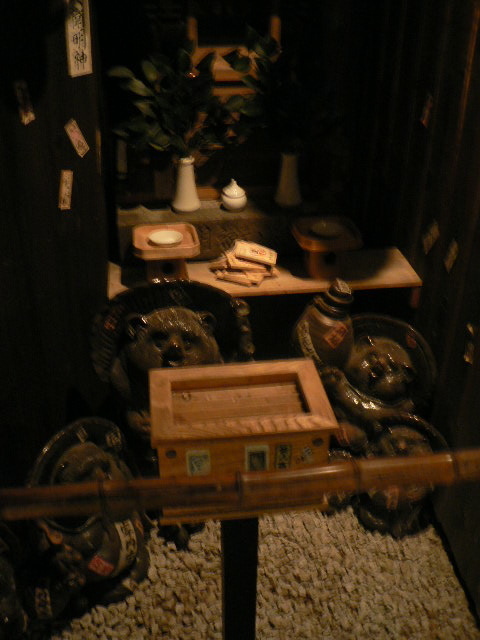 Tanuki are racoon dogs which in folk-lore were able to shape shift and played tricks on humans. I won’t get into their anatomy here but they love sake and since we were inebriated we stopped and paid our respects. Thats a donation box in front. At shrines you toss the money in the box, clap twice (I think this is to get the kami’s attention) and then make your prayer. It was off to the train station and back to the house. Only about a 12 minute train ride. However the local train we’d take doesn’t run past midnight and a taxi back would be “takai” (expensive). The next morning we struck out for a different area. We visited Kyoto National Modern Museum and a shrine that was close by. 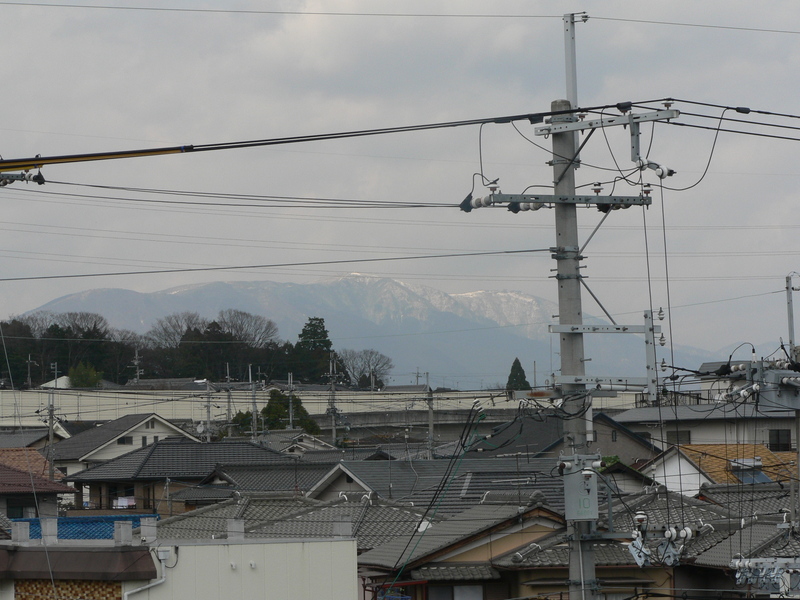 Looking North at the Mountains from our neighborhood train station. It was colder than usual for this time of year and Motoko and I were still recovering from Jet Lag and stomach viruses, but we made the most of it. The cherry blossoms were barely beginning to bud. 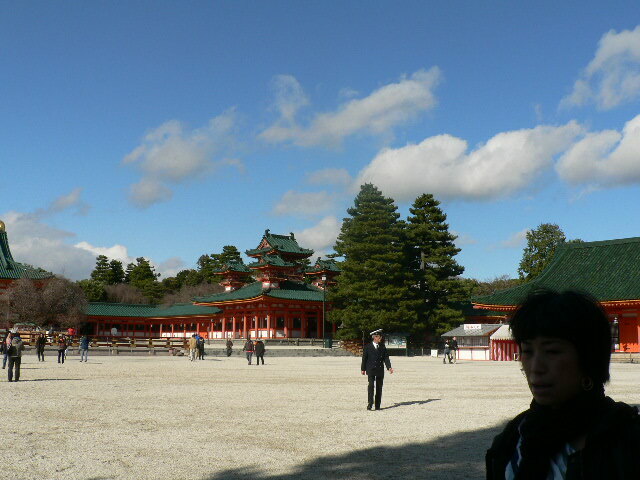 Gate to Heian Jingu (Jingu means shrine) Huge, ain't it. Christo and Jeanne-Claude have nothing on this gate. 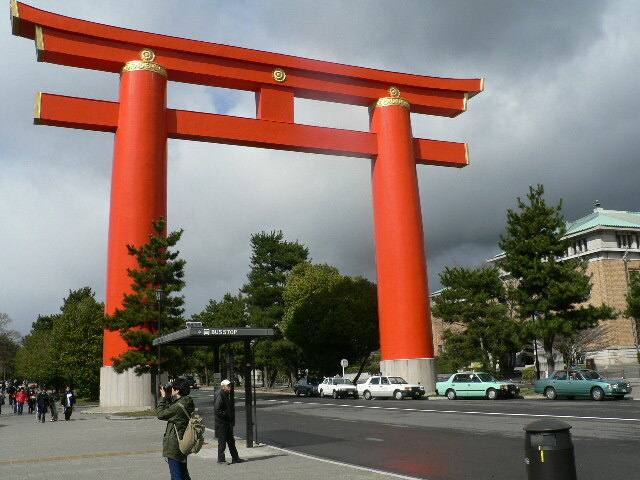 While the gate was certainly impressive against the brooding gray sky and the shrine was big and orange as well but if you ever get over to the National Modern Museum don’t go in with high hopes. The works that were up when we visited were less than inspiring. Photographs of a Japanese and Korean couple accompanied by text about the mutual stereotyping of each others cultures and social commentary about integration of foreign nationals into Japanese society. Understandably something that hits a little home with us, but please make the photographs as engaging as the text. And if I want to read a book I’ll read a book, not go to a museum. The rest of the works were sub par (giant photographs treated to look like paintings and mounted off kilter) with little reasoning to their arrangement. Somebody help this place out and donate some money! I think its very hard for contemporary Japanese artists to prosper outside of traditional arts and may be reflected in this museum. Geez its the first blog and I’m already snob-ing out and complaining. That will probably be my only complaint about my entire experience in Japan. It’s very hard to ignore holding a college degree in fine arts. It was a short second day and this first blog is long enough so I’ll just post some photos. Enjoyed reading about your travels and perspective. Please continue. Thank you! Ty, Life is a strange creature is it not? I don’t believe either one of us could have predicted the events of our futures as they have played out. Your life with Motoko and worldly travels are everything a person with your enlightenment, loyalty, and resolve deserve to enjoy. I am glad to hear that your passion has become your reality and that you are able to express your art and soul while making a buck! I know that you are inbetween Philly and Japan and I in Washington but if there is anything that I can do for you or Motoko, be it moral support or random insight don’t hesitate to write me. You were there for me when I needed it, so I will be there for you always. Life is strange indeed. Thanks for the kind words and I hope you all are doing well on the west coast. I hear the landscape is gorgeous out there! Tyrus' Small Painting Store Great art for affordable prices! !